There are a few plugins and services out there for blogs that automatically create links to content on the web. Some of these tools, such as Chitika are simply ways to monetize content and traffic by showing pop-up ads related to contextual text and others, such as Snap show popups when readers hover over certain types of linked content. Personally, while I like the idea of adding content that makes posts richer, I find both of these solutions annoying and self-serving – the added content in really just advertising that benefits the blogger and not the reader. Now, I have nothing against the bloggers out there making a living, but the main content area is a bit sacred and annoying popups don’t do much to keep it that way. Recently, I came across what I think is a great solution that offers something I can only refer to as “useful popups”. Apture is a tool that installs inside of WordPress as a plugin (there are other versions too) and gives you an incredible library of videos, audios, images and text to draw from by hand to create pop-up links or embeds right into the post. So now when you write about a topic you can offer a multi-media smorgasbord of related content that helps tells the story – all from within WordPress. The Apture interface is very slick and gives the blogger the ability to bring content like YouTube videos, NPR interviews, Wikipedia entries and Slideshare presentations right into each post. You can resize embeds by dragging them to the proper size and even create multiple links for a given phrase. Recently, I had David Allen, author of Getting Things Done, as a guest on my podcast. In the show notes I was also able to offer a useful popup of a video of David demonstrating some of what we discussed. Of course I could also offer David presenting at a conference or an overview of his latest book – Making It All Work. None of this content is ad supported, it contributes, I believe, to the reader experience, and it takes about two seconds to find and embed. A win for all. 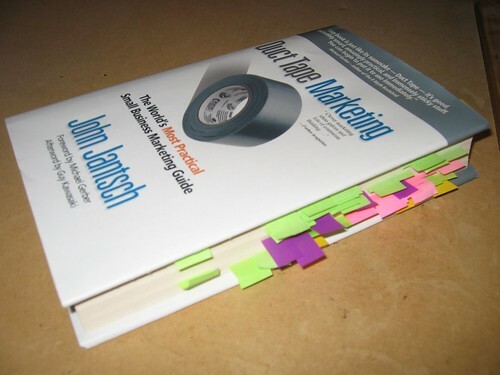 Here’s an example of multiple links using the Duct Tape Marketing book as the search term. The idea of popups being useful might take some people time to get their head around, but the possibilities to enhance content with Apture are pretty intriguing.